Inspector Smart enjoyed having a tough case to solve, but this one was really puzzling. Jesus had been killed and his body put in a cave. Everyone agreed on that. There was a huge stone across the door, and armed guards outside. But even so - the body was missing! Join Inspector Smart as he gets into his super-duper police chariot to investigate the Case of the Empty Tomb. This book is a full-color illustrated story book for ages 4-7. Also available, for ages 8-11, is the Case File and, for all ages, The Rock Went a Rolling 10 rocking songs about Jesus. 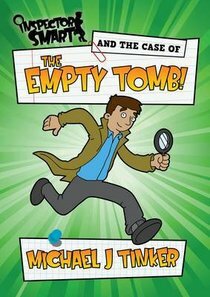 About "Inspector Smart and the Case of the Empty Tomb"
Customer Reviews For "Inspector Smart and the Case of the Empty Tomb"
This book is really exciting and good, but not too long. It is about how Jesus truly died, and came back to life again.